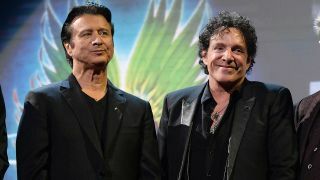 Last year, former Journey vocalist Steve Perry returned to music by releasing Traces – his first album since 1994’s For The Love Of Strange Medicine. With Perry making music again, many fans hoped be could reconnect with Neal Schon and Journey – the band Perry fronted from 1977 to 1987 and again from 1995 to 1998. However, in October last year, Perry poured cold water on that idea by telling Rolling Stone: “I’m not sure that’s possible without stirring up hopes of a reunion. But there’s now a sliver of hope that something between the pair could happen – as Schon has reached out to Perry ahead of his Journey Through Time shows, which will take place at Jackson’s Rancheria Casino Resort on February 22, and Oakland’s Fox Theater the following night. Will it happen? We shall see.